Since Hao used to be a French military base for 40 years, the infrastructure is really nice. A large wharf for the ships has a beautiful inner basin for small boats to dock and a boatramp. The two grocery stores are very modern and well-stocked by Tuamoto standards. There is even a pseudo “marina” less than a mile from the wharf, which cruising yachts are able to use. This is handy because during the dry season, ‘maramu’ winds from the south-east blow along the length of the atoll and cause uncomfortable fetch (waves from wind blowing across water) at the village anchorage. It also offers decent protection from north-west winds during the wet season. 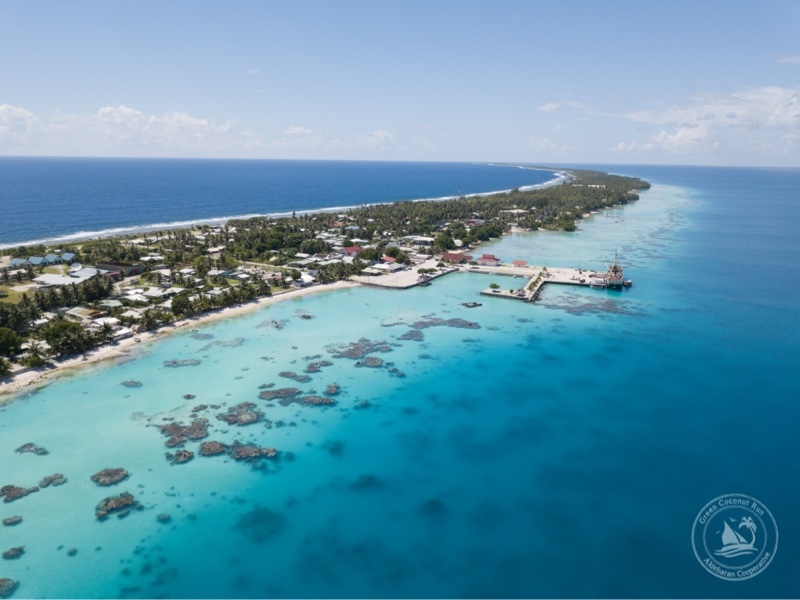 The village of Otepe is located on the west side of the atoll, which shelters the prevailing easterly trade winds and generally offers calm waters. We’ve stayed anchored offshore which we like for the breeze and privacy; at risk of getting snagged on the coral bommies (underwater coral formations) that litter the ocean floor; easy to view from this aerial shot. To overcome this problem, we float the anchor chain on three buoys 10 feet from the sea floor, and have a scuba tank ready to dive to free the anchor chain, 60 feet deep. When the French military ran its base in Hao, we heard that as many as 3,000 people lived here, having relocated from surrounding atolls for the jobs. Now only 800-900 people live in Hao; many have migrated to Tahiti in search of work. The nuclear test sites located about two hundred miles south (atolls Mururoa and Fantagaufa) were the focus of the military base. Besides those atolls, which are still highly restricted, Hao is the southernmost atoll with a navigable ship’s pass. Hence, Hao continues to be the administrative and educational center for the southern Tuamotos. All the school kids come here for high school, and many families move here to be with their kids. People work in fishing, copra, and government jobs (teaching, health care, administration). Although the loss of jobs in the post-military phase is a problem, the general sentiment among locals appears to be relief that the nuclear tests are finally over. Really interesting information on Hao. Sounds like a comfortable place to get some well deserved R & R. Where’s next on your sailing agenda?